EVERSPACE is the new project of ROCKFISH Games, which you may know for its work on the Galaxy on Fire series for Android and iOS devices (the second game actually came out on PC as well and is available on Steam). This time, the German studio is aiming much higher. 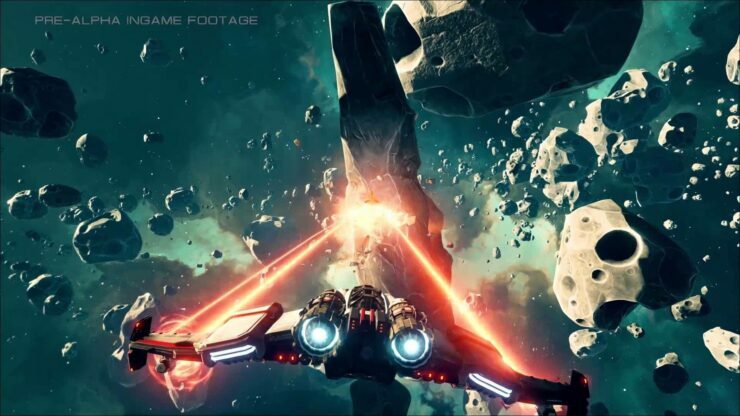 EVERSPACE is being developed with Epic’s Unreal Engine 4 and the early footage released so far looks very good to say the least. Even though the team is busy with the ongoing Kickstarter campaign, we were able to talk with CEO & Co-Founder Michael Schade about this space shooter filled with rogue-like elements, which is targeting a release on PC and possibly on consoles as well. Your studio is known for the Galaxy on Fire mobile series. How different and/or complicated was it to switch to PC development from mobile? The transition went very smoothly. Although it has never been our main focus, we did have a Mac version of Galaxy on Fire 2 on the Mac App Store and a PC version on Steam. So developing for the PC platform is not completely new to us. Of course, there are a lot of differences between PC and mobile development. You have a lot more restrictions on mobile and have to come up with controls that work on a touch screen. Also the session lengths are much shorter and there’s a big focus on Free 2 Play. We’re glad that we don’t have to go Free 2 Play with Everspace and working with Unreal Engine 4 on PC is a blast. It allows us to go absolutely crazy with the graphics, but also on the sound. Without giving too much away, can you tell us something about the story and lore of EVERSPACE? Our hero will wake up on a big carrier in a remote place of the galaxy. He will not have any recollection of who he is and why he is there. He will get a mysterious order from someone unknown to go to a certain location. So he heads to this destination on his ship, hoping to find out more about himself, the world he’s in and the mysterious person. That’s pretty much all we can tell you right now without spoiling anything. How large is the game world going to be, approximately? Also, how long will the story take to complete on average? You could say that the game world is unlimited in scope as it will constantly change every time you play. It’s hard to tell at this point how long it will take to finish the story, as development of the game is far from finished. We’ll have to see how everything works out, but we have an average length of about 20 hours in mind, maybe more. You mentioned that EVERSPACE is a “rogue-like 3D space shooter” inspired by FTL: Faster than Light. Does that mean that you’re using procedural generation in the game and if so, how? Yes, that’s correct. The starting point and the destination of your journey will always be the same. However, all the systems and locations you’ll visit along the way will be procedurally generated. We took extra special care that these locations will always be beautiful to look at and at the same time always offer something new, even if you’ve been playing for hours and hours. We roll the dice on everything that happens inside these locations, meaning resources, loot, enemies, story characters and events. You can never tell what is going to happen next and always have to act spontaneously according to the circumstances you’ll find yourself in. EVERSPACE is going to launch next year when it is expected that Windows 10 will be widespread and many DirectX 12 games will be released. Are you considering DX12 support for increased performance in EVERSPACE? What do you think of the new API? DirectX 12 is supported by Unreal Engine 4 and looks very promising. As you said, it will be very widespread next year, so we will, of course, see which of the cool new features we can use in EVERSPACE. Are you planning to use any NVIDIA GameWorks features in the game? We’re using PhysX and Destruction, which are integrated into Unreal Engine 4. That is all GameWorks technology we’re currently using, but we might be using more in the future. You have already confirmed that support for additional platforms may be reached via Kickstarter stretch goals. Have you already set your mind on a target for resolution/frame rate on PlayStation 4 and Xbox One? Do you believe 60FPS to be important for the gameplay experience of EVERSPACE? 60 FPS is of course always the dream. But the question is if that can be pulled off. I think for our game it is not as important as for example in a first person shooter and the game should play smoothly and look stunning even at a lower frame rate. It’s a little too early for a prediction. Our pre-Alpha prototype runs smoothly with more than 60 FPS on a PC but we have not yet tested it on PS4 or XBox One. Moreover, will you consider cross-play between PC, PlayStation 4 and/or Xbox One? This feature is becoming very popular lately, with several titles employing it in order to create a larger community. It is a very cool feature, indeed. It is however very unlikely that we will see it in EVERSPACE, we would need to raise a lot of money with our Kickstarter campaign in order to first support PS4 and Xbox One and then even a whole lot more money to implement co-op gameplay. But maybe we’ll find another way of having a few cross-play features. We’re toying with the idea of sharing game seeds with other players so that you can challenge your friends and see if they can make it further than you. Thank you and good luck with the campaign.